A luxurious hotel of refined elegance featuring artistic masterpieces and original Italian craftmanship - a modern Mediterranean palace. Located in Anacapri, an exclusive and unspoiled part of Italy’s island of Capri, the five star Capri Palace Hotel & Spa stands 300 metres above sea level, overlooking the open Mediterranean Sea and the Gulf of Naples.The 72 rooms and suites of this 5 star hotel, some with private pool and garden, are decorated in Mediterranean style, offering comfort and privacy. The hotel has three restaurants, L’Olivo – an elegant and refined restaurant with Two Michelin stars, Il Riccio an exclusive One Michelin star restaurant and beach club just steps from the famous Blue Grotto and the more informal “bistrot Ragù” with stunning sea view terrace.A favourite with the international jet set, the Capri Beauty Farm, directed by Professor Francesco Canonaco, specializes in combining aesthetic medicine and wellbeing treatments in personalized, flexible programs ranging from 3 to 7 seven-day stays. The first day is devoted to a medical check-up and nutritional consultation, while the remainder is spent addressing personal health and beauty requirements through a host of effective fitness activities, bespoke rituals and delicious, healthy cuisine inspired by the Mediterranean Diet. The spa, which was voted "Best Medical/Thermal Spa in 2008" by Condé Nast Traveller, offers non-invasive, high-tech procedures such as dermal rejuvenation, radiofrequency, ultrasound diathermy and age-defying collagen treatments in an ultra-luxurious setting. Best known for The Leg School® therapy, which focusses solely on the legs with cold, medicated mud and bandages followed by the Kneipp hydrotherapeutic path, where guests are immersed in shallow tanks of mineral water set at different temperatures to promptly reduce water retention, increase vascular resistance and boost metabolic activity - all while delighting in this enchanting island as Jackie O once did. Within the Capri Palace Hotel, in 1992 the “Capri Beauty Farm” was established. Directed by Francesco Canonaco, it specializes in aesthetic medicine and pampering treatments with flexible, personalized plans. The Capri Beauty Farm’s personalized and state-of-the-art treatments are the product of ongoing medical research. Some of these treatments now have international patents. First and foremost of these is the “Leg School” program, known throughout the world for the excellent results achieved in the prevention and cure of cellulite and vascular problems in the legs. The hotel's 60-square-meter fitness center, housed in the spa complex, features TechnoGym equipment; guests can also work out with a personal trainer. There are two swimming pools and three restaurants. L’Olivo (Two Michelin Stars), Il Riccio (One Michelin star) and the casual Bistrot Ragu. A complimentary shuttle service transports guests to Il Riccio, the hotel private Beach Club next to the Blue Grotto; Other attractions include Villa Jovis, a Roman palace built by Emperor Tiberius; and the Villa San Michele, where guests can enjoy expansive views of the city and its marina, Sorrentine Peninsula, and Mount Vesuvius from the villa's gardens. 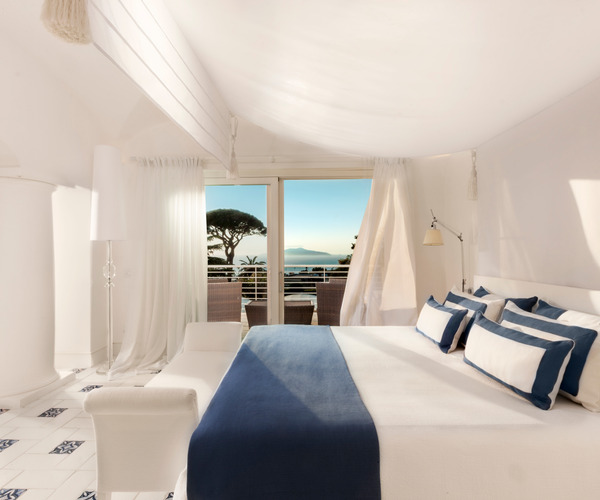 Capri Palace offers 72 guest rooms. Beige and white interiors add to the chic feel, as do the marble bathrooms and furniture. Some suites feature private pools and gardens, and some accommodations come with balconies and views of the sea and the green hills of Mount Solaro. The Presidential Suite offers the utmost in luxury, with black marble flooring, antique art deco furnishings, and two bedrooms equipped with private pools. Capri Palace's three restaurants, including the award-winning L'Olivo with two Michelin stars, emphasize Mediterranean cuisine and Capri specialties, as well as sumptuous seafood barbecues. Light and traditional fare is served at the Bistrot Ragu , while sea food dishes are on the menu at one Michelin Star Il Riccio Beach Club & Restaurant. With its live music and Italian artwork, the Artist's Bar provides a sleek atmosphere for aperitifs. A portion-controlled spa menu is available at Capri Beauty Farm.